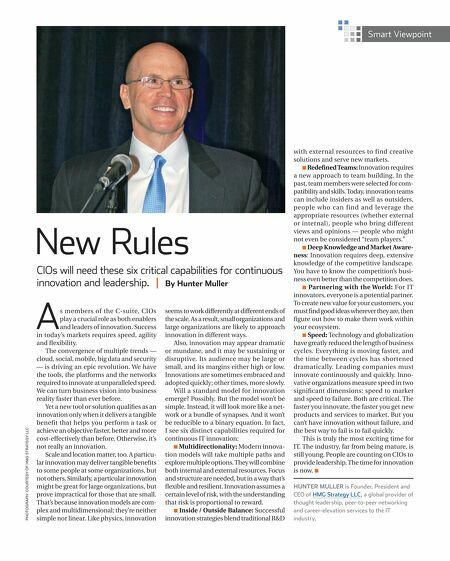 Smart Viewpoint New Rules CIOs will need these six critical capabilities for continuous innovation and leadership. | By Hunter Muller photograph: Courtesy of HMG Strategy LLC A s members of the C-suite, CIOs play a crucial role as both enablers and leaders of innovation. Success in today���s markets requires speed, agility and flexibility. The convergence of multiple trends ��� cloud, social, mobile, big data and security ��� is driving an epic revolution. We have the tools, the platforms and the networks required to innovate at unparalleled speed. We can turn business vision into business reality faster than ever before. Yet a new tool or solution qualifies as an innovation only when it delivers a tangible benefit that helps you perform a task or achieve an objective faster, better and more cost-effectively than before. Otherwise, it���s not really an innovation. Scale and location matter, too. A particular innovation may deliver tangible benefits to some people at some organizations, but not others. Similarly, a particular innovation might be great for large organizations, but prove impractical for those that are small. That���s because innovation models are complex and multidimensional; they���re neither simple nor linear. Like physics, innovation seems to work differently at different ends of the scale. As a result, small organizations and large organizations are likely to approach innovation in different ways. Also, innovation may appear dramatic or mundane, and it may be sustaining or disruptive. Its audience may be large or small, and its margins either high or low. Innovations are sometimes embraced and adopted quickly; other times, more slowly. Will a standard model for innovation emerge? Possibly. But the model won���t be simple. Instead, it will look more like a network or a bundle of synapses. And it won���t be reducible to a binary equation. 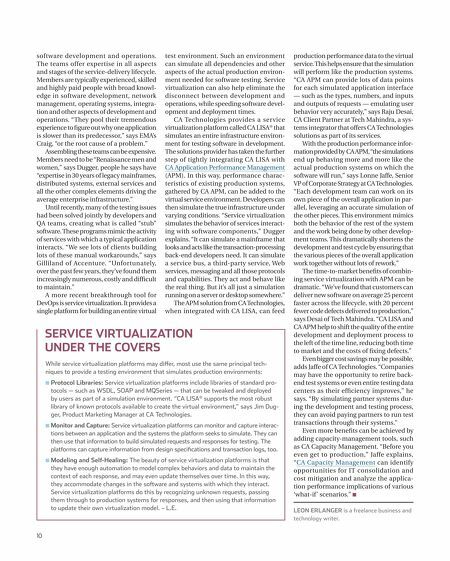 In fact, I see six distinct capabilities required for continuous IT innovation: n Multidirectionality: Modern innovation models will take multiple paths and explore multiple options. They will combine both internal and external resources. Focus and structure are needed, but in a way that���s flexible and resilient. Innovation assumes a certain level of risk, with the understanding that risk is proportional to reward. n Inside / Outside Balance: Successful innovation strategies blend traditional R&D with external resources to find creative solutions and serve new markets. n Redefined Teams: Innovation requires a new approach to team building. In the past, team members were selected for compatibility and skills. Today, innovation teams can include insiders as well as outsiders, people who can find and leverage the appropriate resources (whether external or internal), people who bring different views and opinions ��� people who might not even be considered ���team players.��� n Deep Knowledge and Market Aware�� ness: Innovation requires deep, extensive knowledge of the competitive landscape. You have to know the competition���s business even better than the competition does. n Partnering with the World: For IT innovators, everyone is a potential partner. To create new value for your customers, you must find good ideas wherever they are, then figure out how to make them work within your ecosystem. n Speed: Technology and globalization have greatly reduced the length of business cycles. Everything is moving faster, and the time between cycles has shortened dramatically. Leading companies must innovate continuously and quickly. Innovative organizations measure speed in two significant dimensions: speed to market and speed to failure. Both are critical. The faster you innovate, the faster you get new products and services to market. But you can���t have innovation without failure, and the best way to fail is to fail quickly. This is truly the most exciting time for IT. The industry, far from being mature, is still young. People are counting on CIOs to provide leadership. The time for innovation is now. n Hunter Muller is Founder, President and CEO of HMG Strategy LLC, a global provider of thought leadership, peer-to-peer networking and career-elevation services to the IT industry.